When Angelina Jolie announced her elective double mastectomy surgery, my mother-flesh cringed. She did it for her children. Who will not laud Jolie’s courage, and, if nothing else, at least her intent? Only those who have not felt the weight of their neighbor’s glory. This spring, I felt its weight again. At my son’s college graduation, I almost could not lift my chest for air, nor could the other thousand parents sitting in graduation finery beneath the California sky. The moment we all feared came at last: his name was read, and his parents walked slowly to the dais, took the offered diploma and stumbled down while we crumpled our programs under his absence. Just months before graduation, he was killed in an accident near campus. We could hardly bear the weight of even the thought of such grief, but I saw prayers running down faces beside me, prayers pressed into clenched programs, prayers kneaded into tissues. Every one of us watching carried those parents across the stage. And most of us knew that this year the women’s basketball coach lost her husband to cancer just before the birth of their first child. 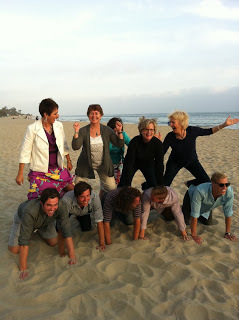 After the ceremony, later that day, we met our son and his six roommates and all their families at the beach and one hour later, we were building human pyramids in the sand. What a silly thing to do, I thought, what a California cliche, even as I laughed and snapped photos of these young men kneeling on their fathers’ backs. And then the fathers kneeling on their sons’ backs. And wait! The mothers were not forgotten. We, too, pressed our knees into our sons’ backs and held steady in the sand for a moment. I don ‘t know if we were just having fun—or if we were enacting something more that day. I think maybe something more. This is truly how we stand in this world: our knees pressed in the bodies of those who have gone before us, beneath us. Our childrens’ knees in our own backs. The Bible talks about this as the “cloud of witnesses” whose words and lives hover over us and form the foundation beneath us. These silly photos, then, are the truth of our lives. We neither stand nor kneel alone, no matter how much independence and self-reliance we claim, and I have claimed a lot. There are so many beneath us. So many noble, humble, simple, wise people. Even the ones who have hurt us, whose weight and knees have broken our backs, or whose substance has crumbled beneath us. We would not be ourselves without them. We would not be our limping but still kneeling selves without them. And we would not offer our backs to others without them. I hope as I write and as I live that I can keep my place, steady. I hope I am not too heavy for those carrying me. I hope I am humble enough to hold strong for those I am bearing. I hope all these things for you, as well. This entry was posted in Encouragement, Writer's Life by leslieleylandfields. Bookmark the permalink. Love this, Leslie. So true, these gratitude-producing thoughts. I, too, have experienced some horrible things, but God… He’s the One who doesn’t waste anything. And He’s the One who strengthens our backs (as writers, our words) so we can offer them to others. I thank you for sharing! Thanks so much Cheryl. Yes, and this is what we are doing as well—through our words offering our backs to our readers. Here, step here . … And don’t we stand ourselves on so many other writer’s backs?? Awesome post, Leslie – full of truth and tenderly thought-provoking. Well said, sister. Well said. A beautiful meditation, Leslie. Sometimes we writers get so enthralled with our solitude as we write, we forget that life is a group effort. Thanks for these words. Powerful ending for a compelling post – and SO true! Thanks for sharing your heart with us.